Leche Flan – the light, tender, sweet custard served during fiestas, big family get-togethers and potlucks – is the Filipinized version of Southern Spain’s Tocino del Cielo, which means ‘bacon from heaven’. Of course this ‘tocino’ contains no bacon, but that should clue you in to its rich, decadent, grunt and eyeroll-inducing deliciousness – much like its porky namesake. That’s because, unlike traditional flans – which are made with whole eggs and milk or cream – Tocino del Cielo is made only with egg yolks, sugar and water. No goopy egg whites, no dairy to compromise its texture and lightness. That makes Tocino del Cielo the flan of flans, and our Leche Flan, well, its poor man’s version – in fact, a poor man’s version of even the traditional flan. The Philippine Leche Flan – at least the recipe I’ve been taught – contains mostly egg yolks, yes, but with a couple of whole eggs thrown in “parsimoniously”. And, instead of whole milk or cream, we use condensed milk and evaporated milk. So you see, ours is a frugal flan – also one that speaks of our double colonization (by Spain, whose Tocino del Cielo once underscored the divide between the poor indio and his conquistador and, of course, the US who market-tested and brought these canned goods, along with Spam, to our shores. 1. In a flan mould or a 4″x8″ meatloaf pan, caramelize the sugar by stirring constantly over medium heat. When melted, tilt the pan to cover the sides, up to 2 inches high. Set aside to cool and harden. 2. Omit this step if not using pandan: In a saucepan over medium heat, combine evaporated milk, water and pandan. As soon as the mixture starts to boil, turn off the heat. Do not allow to boil! Set aside to let the pandan infuse. Do not use until the infused milk and water mixture is cool. Discard the pandan. 3. Beat the egg yolks & whole eggs until somewhat combined. Do not overbeat or stir, otherwise bubbles will form in the flan! 5. Strain the mixture using a double cheese cloth (for a finer consistency) or use a fine-mesh strainer. Pour into the caramel-lined flan mould. 6. Place the mould in a high-sided baking pan or aluminum tray. Fill with water enough to reach 3/4 the height of the mould or at least to the same level as the flan mixture. Bake at 320ºF degrees, uncovered, until firm (approximately 2 hrs). Test for doneness by inserting a toothpick – it should come out dry. 7. Cool and refrigerate to set, preferably overnight, before removing flan from the mould. 8. To serve, remove flan by inverting mould onto a plate. 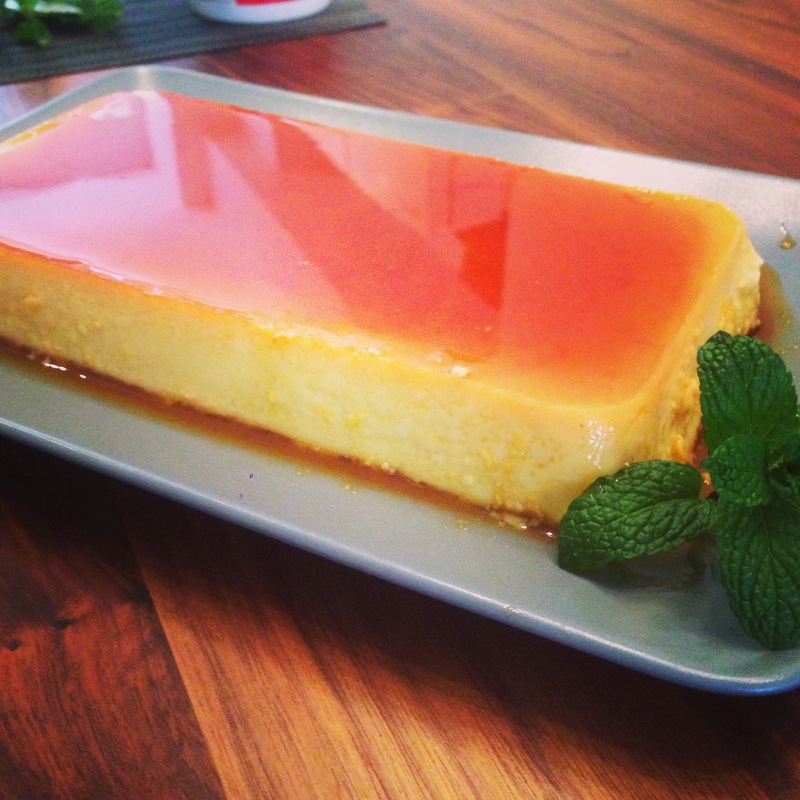 Drizzle flan with the remaining caramel from the mould. Zest lime on top. Unless you grew up in gated and exclusive villages like Forbes Park and Dasmariñas Village, you’d be familiar with the ambulant vendor who usually came around at breakfast or sometimes for mid-afternoon merienda, shouting “Ta-hoooooo”. The call, its lilt, exactly where the voice would start low (on the first syllable) and then crescendo on the second, with a throaty elongation of the “o”…. Of course you remember that, you KNOW that. Because, whether that taho vendor was in Singalong or BF Homes, the sound was the same. The sight too was the same, of those two large aluminum buckets of taho the vendor carried and balanced on his shoulder with a bamboo yoke or some piece of wood. How weighty those buckets looked, bobbing up and down as the magtataho (taho vendor) walked down the street and up to your door. To this day, I can’t think of a more universally Filipino sweet treat. Despite recent innovations back home in terms of flavouring and marketing (taho can now be purchased from shiny metal carts in airconditioned malls), to most Filipinos, taho is a singular experience, a singular taste: soft, silken, steamed tofu scooped in thin layers into a cup, then drizzled with a dark simple syrup and small sago pearls. Funny how the universally Filipino taho is actually of Chinese origin, reminding us once again of our long history of trade with China. That is, until I found this recipe from Kawaling Pinoy. Why sweat it? Just use store-bought Extra-soft or Silken Tofu!